Given the overly-familiar nature of many low budget films, anything which comes up with an idea that’s at all novel should be congratulated. 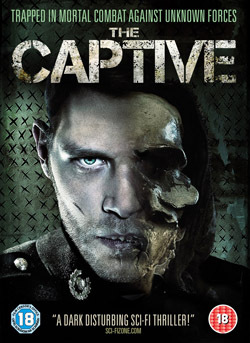 Although it’s not exactly original – it’s essentially a mash-up of Groundhog Day, Slaughterhouse Five and The Sixth Sense – The Captive (which was also released as Armistice) deserves some credit for trying something different. Made in 2013 by debutante director Luke Massey, it’s technically raw and never manages to hide its limited funds, but with a running time of just over 80 minutes it succeeds in maintaining the attention despite the lack of breadth to the narrative (although that’s not to say that it might not have been better treated as a thirty minute short). 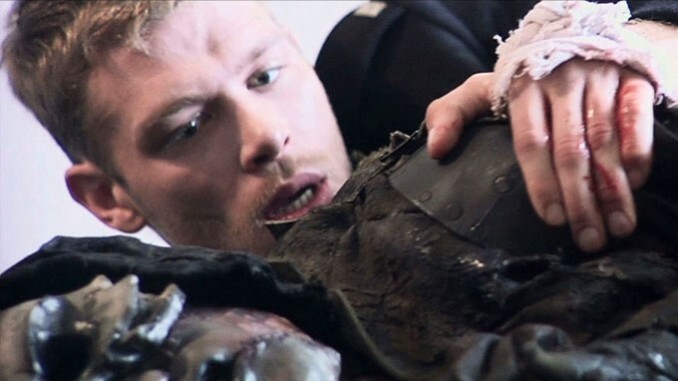 Soldier Budd (Joseph Morgan) wakes up in a house which seems to be strangely familiar. As soon as the clock strikes nine he’s attacked by a strange humanoid creature and left with no option but to kill it. When he tries to leave he finds the door is locked, the windows can’t be opened (and offer no view of the outside world) and the phone doesn’t work. He goes to sleep, wakes up the next morning… and the whole thing happens again. Days pass: he is always provided with the same food (a bacon sandwich for breakfast, chips for tea, all of which magically appears without anyone seeming to put them there), always has to fight a single creature, always wakes to find any damage has been repaired. Then he finds some diaries left by a previous inhabitant, Edward Sterling (Matt Ryan), who has documented the increasing tedium of his life and the repeated and unsuccessful attempts to escape that he carried out over his many years’ captivity. 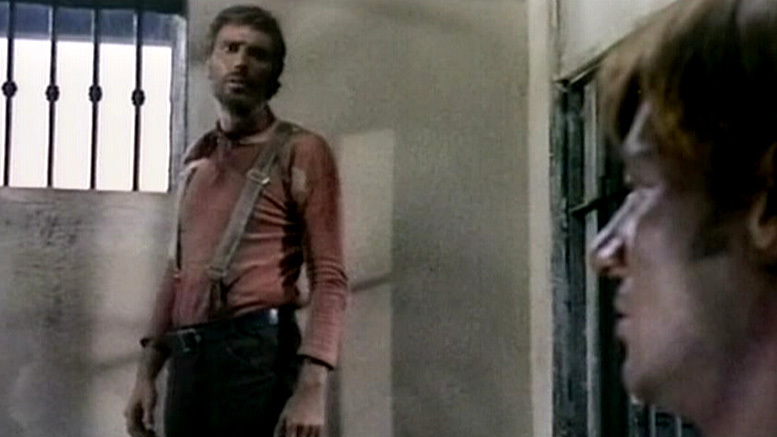 Given that much of the plot is based around repetition, Massey and his co-writer Benjamin Read manage to milk it with some efficiency. A considerable amount of time is given over to flashbacks of Sterling’s history in the house, while Budd’s growing mental disorientation and increasingly frantic attempts to find a way of leaving are depicted with some care. There are some interesting ideas – when Budd carries out an impromptu autopsy on one of the creatures he finds some medals and the head of a bayonet among its internal organs, giving a significant hint as to its origins – while the whole thing takes a more metaphysical turn towards the conclusion. It’s not exactly a horror film, not exactly a science fiction film (even though it contains elements of the both of them) and although I can imagine many being put off by the way it doesn’t attempt to provide easy answers, my view is that it works all the better for it.